Boundary Stones of Washington, D.C.
About 1000 feet southwest of the southern end of Oxon Cove Bridge and about 200 feet east of the Potomac River. Oxon Cove Bridge is the bridge that I-295 crosses just north of the intersection with I-495. 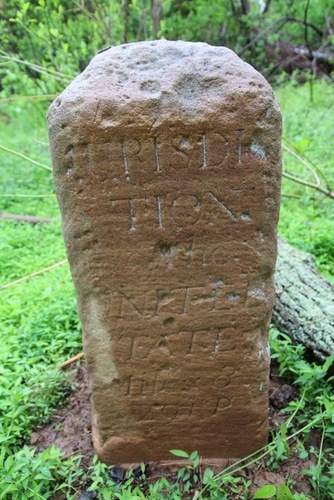 You can reach this stone on foot by following the partially-paved path that leads to Oxon Hill Farm from either D.C. Village Lane in Washington or the intersection of Oxon Run Drive and Audrey Lane in Maryland. Leave the path when it turns away from Oxon Cove; then follow the Oxon Cove shoreline to the base of Oxon Cove Bridge, where you must cross underneath I-295 to get to the Potomac River. From the endpoint of the large rocks that surround the base of the bridge, follow the Potomac shoreline about 1,000 feet southwest until you are just past due west of the Masonic Memorial (across the river) and the bridge is no longer visible behind you. If you are on a small sandy beach with car tires and debris, you are in the right place. The stone is about 200 feet to the east. View the walking route from Audrey Lane. The terrain along this route is marshy and occasionally rough, so it may be much simpler to access the stone by car. Park on the right shoulder of the southbound lanes of I-295 near the "Maryland Welcomes You" sign and walk west into the forest to a fence. Follow the fence several dozen feet north to reach a small hole. Enter the hole and walk west through the forest. Depending on your route, you may cross an empty field that once was a staging area for the construction of the highway. Continue west to a very steep hill (actually an earthen dam created to protect the highway from flooding), and walk north, keeping on the east side of the hill, for a short distance. As documented by Woodward, this stone once was next to the Potomac River at Fox Ferry Point, the terminus of an 1800s ferry line from the foot of King Street in Alexandria to Maryland. In the early 1950s, 1969, and 2016, the stone was moved northeast of Fox Ferry Point to save it from being damaged by the river. The National Register of Historic Places incorrectly states that the stone is east of Shepherd Parkway, when, in fact, it is west and nearly a mile south of the end of Shepherd Parkway.